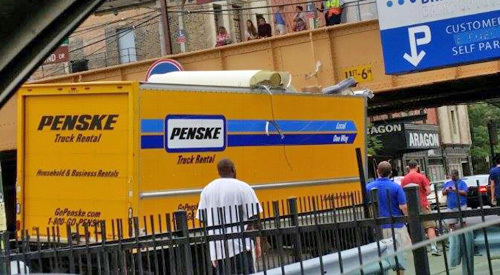 The infamous Lawrence Red Line overpass, aka "The Can Opener," claimed yet another victim over the weekend, as this Penske truck was the latest to get the unwanted open-air driving experience. We wonder if the sign posting the 11'6" clearance on the bridge is wrong, or if there are really that many oblivious drivers? This overpass averages about one shearing a month.